Favorite food: We think it’s bananas- she eats them so fast she gets hiccups afterwards! Chloe was originally a family pet who had a difficult start to life. Her owner had her canines removed, a common practice to avoid being bitten by wild primates that people have tried to domesticate. 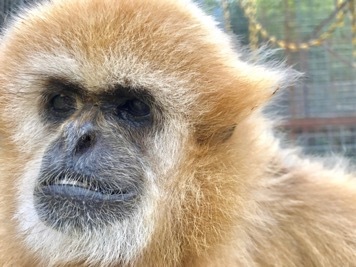 Unfortunately, the surgery did not go well; gibbon canines have very deep roots and part of one of Chloe’s was left in her jaw, resulting in an infection and permanent deformity. Luckily, she recovered and has to be fed only a slightly modified diet.  Chloe came to IPPL in 2007 after living at another sanctuary for two years. While we don’t know exactly how old she is, Chloe looks like she is in her 40’s. Despite her age, she is quite lively and often swings around the vertical support pole at the top of her enclosure. In March 2010, Chloe was placed with an elderly, deaf, widower gibbon named Blackie. Her presence puts an added spring to his step, and they get along very well together. They often play and wrestle, even at the very top of their enclosure. When they play it almost sounds like cats fighting, which tends to freak out people when they first hear it, but it’s all in the name of fun!